Product Description: The kennel castle dog house and dog run is designed for large breed dogs in mind with a big dog house built into the actual dog run. These eye-catching dog houses provide a safe and comfortable shelter for your dogs, while making it easy and fun for you to care for them. The huge spaced dog houses can accommodate 2-3 dogs. It maximizes space by using multiple levels in its design. This also creates a dog playground environment for your pets. The house itself is elevated off the ground to protect from rain and water entering the dog house. This also creates a shelter under the dog run. The large front dog door is protected by a vinyl flap door and is easily accessed with a 4' foot ramp leading right to the dog entrance. It is built of wood and steel which are both maintenance free materials. The wood is painted and the metal is powder coated both for long life. The kennel castle system has a large access door allowing you to access your dogs and puppies without entering the kennel. The kennel castle comes unassembled in a large package and sets up in no time without any tools required. Product Description: The K9 Kennel Store Complete dog kennel system is the best way to get you and your pet kenneling today. The 8' X 16' complete dog run is made of all steel and has a powder coated finish which provide an attractive, weather and acid resistant coating that ensures years of protection from pet waste and other elements associated with kenneling? They are suitable for both home and professional use. This dog enclosure includes a digging prevention system that will discourage your dog from tunneling or digging out of his dog cage. The heavy duty canvas top will protect your dog from rain and snow as well as proving dog sun shade. The 64oz dog feeding and watering bowls snap right to the side of the kennel and are made of stainless steel. Product Description: The K9 Kennel Barn is a huge dog house at 48" x 48" x 54" tall. It is a unique large dog house because it is raised 2 feet off of the ground to keep water out and give your dog room to lounge under this big dog house in the shade. Our Kennel Barn is designed as a large breed dog house or for multiple dog housing. It is double walled plastic with a powder coated steel frame making a maintenance free, extra large dog house. Plus it is insulated to provide a warm dog house for your pets. Kennel Castle can be a custom dog house by configuring the run in unlimited shapes and sizes along with choosing from many options to make this xl dog house perfect for your needs. The Kennel Barn luxury dog house doubles as a jungle gym for your dogs because they love to play on the porch and ramp and underneath the pet house. 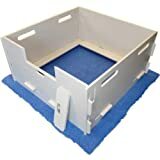 Product Description: This 8' X 8' Standalone dog kennel system sets up quickly no tools required. This kennel is made of all steel construction and powder coated for long life. Available in expanded metal kennels or welded wire kennels. Product Description: Your pupper deserves a place of his own that can keep him out of the elements while also giving him a sense of security. Give them the Lucky Dog Uptown Welded Wire Kennel and look forward to more tail wagging! 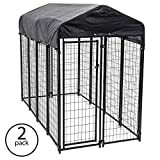 This kennel is made of heavy duty steel and rust resistent wire so that it can continue to be the perfect home for your companion for years to come. Man's best friend can stay dry and cool under the fully enclosed waterproof tarp cover that features UV protection, keeping it in prestine condition against ripping, cracking, or fading. Preassembled panels keep setup time to a minimum so you can enjoy your furry friend's company even more. When it's time to clean up, just hose down the floor or sweep everything up under then 1.5 inch raised legs. Give your dog the best home sweet home. Give them the Lucky Dog Uptown Welded Wire Kennel. Product Description: MagnaBox Next Generation Professional Whelping Box is made of FDA-approved HDPE plastic making it the perfect solution to keep moms and babies contained. The gray, lightly textured surface resists dirt and damage, plus it is chew proof. There are no cracks or crevices to harbor bacteria or contamination. With slip-fit connections, the box needs no tools to assemble and is easily cleaned. The unique design has no bottom, so it can set on a whelping pad or surface of your choice. The entrance door features unique 1/3 and 2/3 height sliding doors which allow you to adjust the height of the opening depending on the size of the puppies.